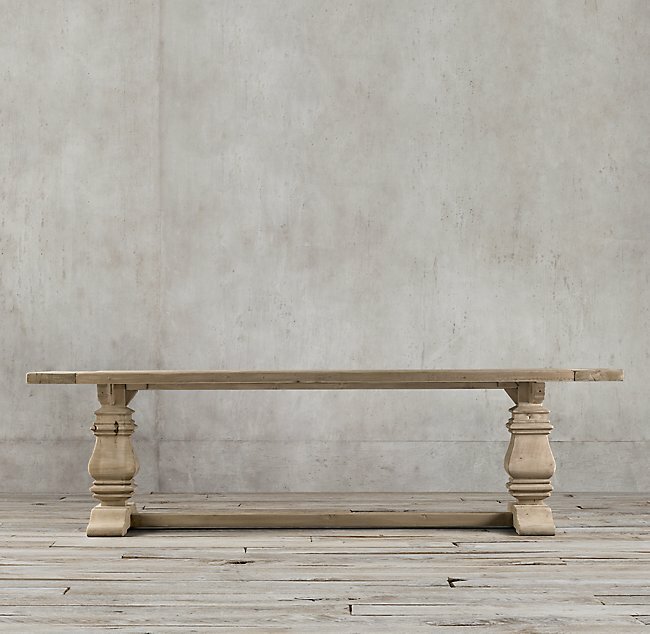 Best Restoration Hardware Style Farmhouse Dining Tables - for Less! So I’ve been looking for a dining room table for what seems like forever now! Not looking everyday, all-the-time mind you, but looking here and there and shopping around for at least two years. I’ve been looking on the internet, in catalogs, shops, and antique stores, as well as on sites such as Chairish and Ebay. At first, it was a matter of simply looking, since I wasn’t sure what style I wanted, or even what color. However, now it’s become even more of a challenge, since I essentially want the Restoration Hardware Trestle Table, but I don’t want to pay that price! At $3000.00, that is quite a bit more than I’m willing to spend! So now I’ve been scouring the internet (and Craig’s List) to see if I can come up with either a used RH table, or just a copy that will work. Even I’m a little surprised that I’m choosing this particular table. For one, it’s everywhere! And also, it’s a pretty strong farmhouse look and I wasn’t sure I wanted to go there. However, after looking at what feels like literally hundreds of tables, it really started to grow on me. And this photo had a lot to do with that…. I love the way this table looks with dressier pieces around it. Design by Linda MacDougald. This was another photo where a comparable table caught my eye. This isn’t the Restoration Hardware table, but it’s very similar and it’s combined with chairs that are very much like mine. 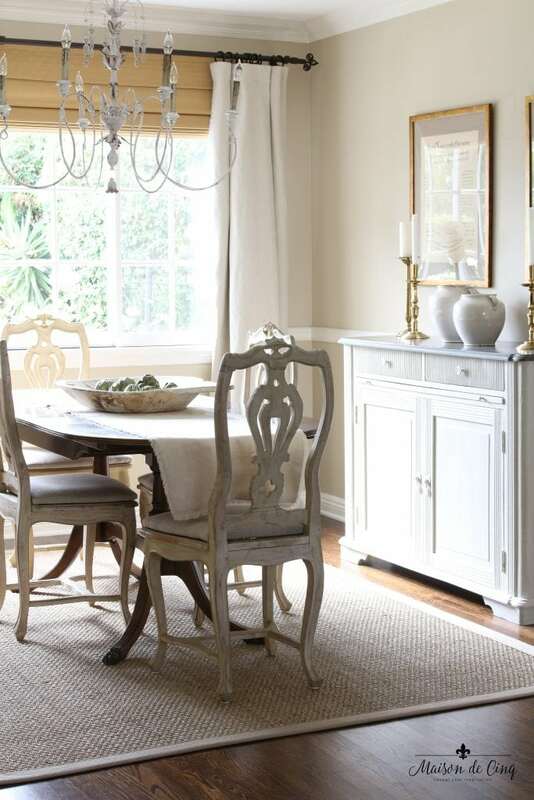 Design by Meredith McBrearty via Traditional Home. 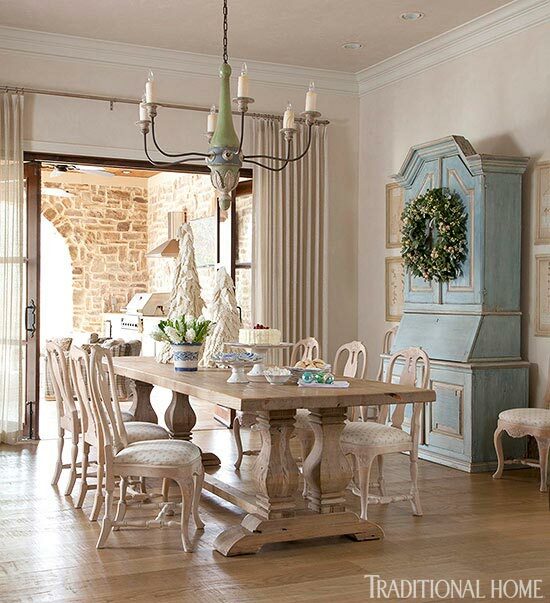 And I love this look, too, with the slipcovered chairs. Design by Kelly Deck. See what I mean? It just seems to work! Regardless of the space, and no matter what it’s combined with, it holds its own. One thing I love is that because it’s made from reclaimed wood, it’s very casual. I like the idea of toning down the dressiness of my dining room. 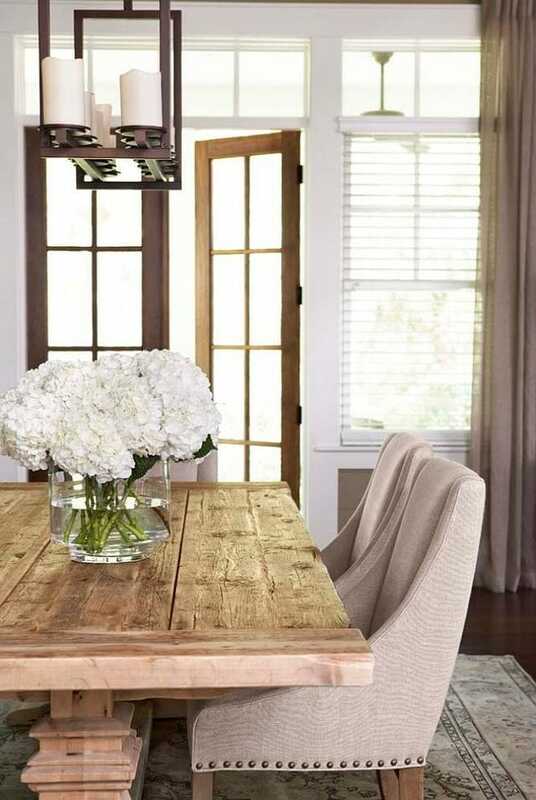 I feel like the curtains and the chairs are already on the formal side, so combining them with a more distressed, farmhouse style table will create the balance I want in the room. Okay, so even I was surprised by how many good options there are – at literally a fraction of the price! 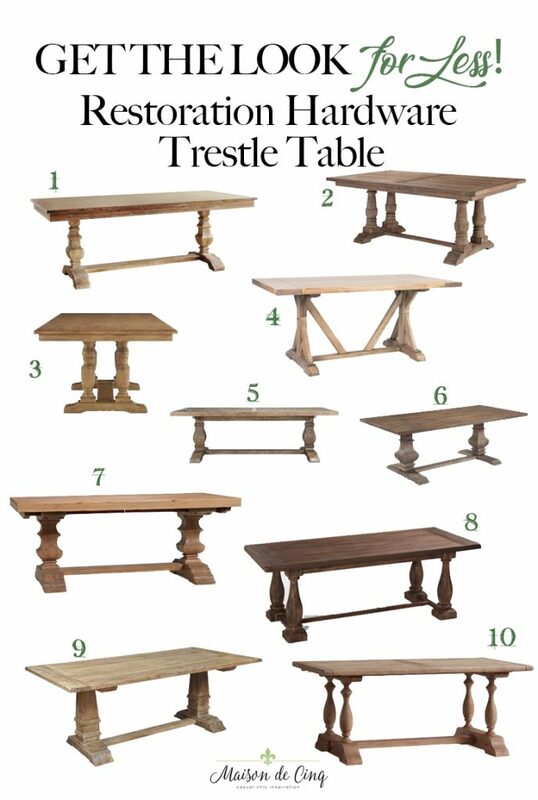 And since this is such a popular table, I thought I’d share with you what I’ve found. I’ve never been so excited to share great information! I’ve been calling the RH outlet weekly for months, and the table doesn’t come in often. Or it comes in but it’s the bigger size. Or too damaged. And the price is still not as low as most of these! So I can definitely say I will be ordering one of these! I’ll keep you posted! Scroll & Click to Shop the Photos! I was on a quest for a RH style table and really got overwhelmed! I saw Nancy’s at Artsy Chicks Rule and knew that was what I could afford and liked. Reading blogs has become an enjoyable pastime for me and I have learned so much from how to clean a toilet to making a slipcover!! I found your blog on French Country Fridays! I like your sideboard/buffet/server — whatever it is called— I like it. Do you mind sharing where you found it? Your style is so appealing! Congratulations to you gals for a successful 1 year French Country Friday anniversary! Hi Cecilia and thank you for your kind words! My buffet in my dining room is from Wisteria. I’m not sure if they make it anymore but you could try searching. And I love that you love blogs! I feel the same way! I found my first blog probably 8 or 10 years ago and I’ve been hooked ever since. It’s always fun to learn and be inspired – I’m so glad we could do that for you! I hope you’ll sign up for my emails, too!